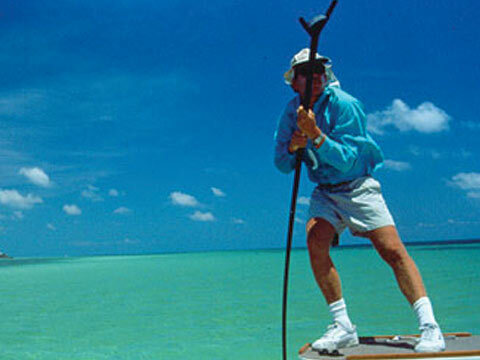 The Saltwater Angler in Key West is the most complete technical saltwater fly fishing outfitter. We sell the finest gear and provide outstanding Guide Services for every type of fishing in the Florida Keys. Tony Murphy has created the ultimate experience for fishing in Key West. Providing one of the best Florida Keys fishing guide services specially suited for your needs and ability. Our guides are professionals and will ensure that you have a pleasant and exhilarating fishing experience. The Saltwater Angler has an extensive inventory of tropical clothing for men, woman and children. We carry brands like Simms, Patagonia, Ex-Officio, Columbia, Water Girl, Royal Robbins and Hook & Tackle. These companies have the finest tropical clothing for anglers and non-anglers alike. We carry footwear by Teva and Sebago for men and women. Keep a memory of your trip to Key West with many fine gifts in the shop like stained glass art in the shape of fish, windchimes, gifts for children, luggage from Orvis, Simms, and Patagonia, and some fine locally made jewelry. The Saltwater Angler prides itself on our selection of fly and light tackle rods by Sage, G.Loomis, Shimano, Winston and Orvis and reels by Abel, Orvis, Tibor, Ross, and Shimano. If there is anywhere you would be comfortable purchasing fishing equipment for salt water fishing, the Saltwater Angler is it! Fine artwork and photos of past angling experiences fill the walls at the Saltwater Angler. Featured artwork includes vibrant works of art by Vaughn Cochran. We have many of his prints and tiles with colorful tarpon, permit, bonefish, barracuda and mahi dolphin depicted. Drawing inspiration with a waterfront view west toward the Marquesas, we have opened our new store into a magnificent 4,000 square foot facility at Westin Key West Resort & Marina. Our front door opens only 20 feet from where the aquamarine waters of the Gulf of Mexico blend into the royal blue of the Atlantic Ocean. It is a tropical margarita swimming with fish. Come inside and browse our selection of Fine Fishing Products, rare books, and professional guide services. Fly Fishing Rods Fly Fishing Reels Saltwater Flies Saltwater Fly Lines Men's Clothing Women's Clothing Hats & Visors Books on Fishing Fishing Pliers & other accessories Stained Glass Fish Vaughn Cochran Art Sale Items Winston Rods We now carry the Winston Boron IIx rods. Winston Rods -We now carry the Winston BIIX rods. The BIIX is one of the lightest rods on the market and both models are crafted with Winston's uncompromising quality. If you have not tried one of these rods, do yourself a favor and cast one. Stained glass art available. Beautiful fish rendered in stained glass. A perfect gift for any angler. Saltwater Angler Products Fly Fishing Rods Fly Fishing Reels Saltwater Flies Saltwater Fly Lines Men's Outerwear Women's Outerwear Hats & Visors Books on Fishing Fishing Pliers & other accessories Luggage, Packs & Bags Stained Glass Fish Vaughn Cochran Art Sale Items We are always adding more products to the online store, if you are looking for something in particular, please ask We offer Free Shipping on selected items. New Artwork in the online store! Bright Fish Tiles by Vaughn Cochran. We have fly rods by Orvis, Sage,and G.Loomis . Best of all we do not charge for FedEx Ground shipping! We have a knowlegable staff available to help you choose the right rod or answer any questions about the "action" of fly or light tackle rods.